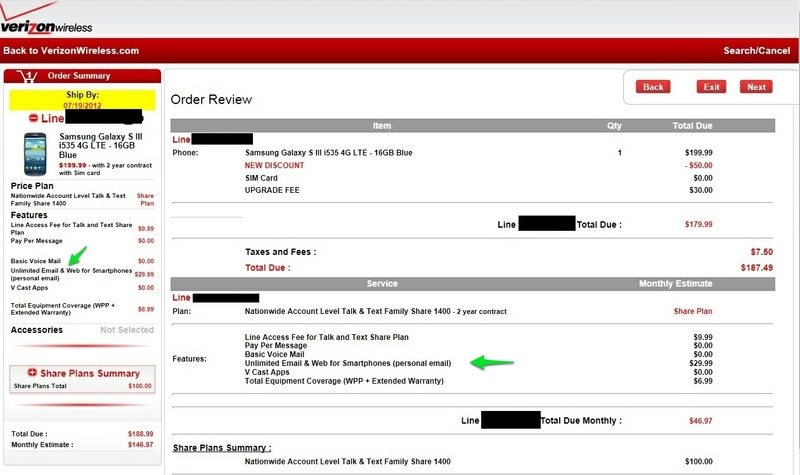 We aren’t sure if this is the case for every Verizon customer, but so far this week, we have heard from a handful who used an upgrade over the past few days and were still allowed to keep unlimited data. From what we were told when Share Everything plans went live, unlimited data was only going to be kept if you purchased phones at full retail. We aren’t sure if Verizon is being extra kind this month, if they are temporarily allowing upgrades as they did pre-Share Everything, or if this is some sort of an error in their system. AT&T announced their shared data plans this week and even announced that customers will be able to keep their existing unlimited plans with upgrades for the foreseeable future. Maybe Verizon wants to align themselves with that? What we do know is that we have a screenshot below of a customer upgrading this week to a Galaxy S3 and finding that he was able to keep unlimited data. We also just received an email from a reader whose wife is upgrading from a DROID 3 to a 4G phone and was told that she could keep unlimited, but that this was only going to be allowed for a short period of time. Update: We are hearing from friends of ours that this is pretty random. Some people are still able to keep unlimited, while others are not. It could have to do with inadvertent canceling of Galaxy S3 pre-orders and those customers are now given a chance to upgrade. It could also be that some are more special than others and simply slipping through the cracks. If you have yet to use an upgrade, would you mind cruising into your account today, walking through half of the upgrade process on a phone, and then telling us if it is allowing you to keep unlimited data? Afterwards, please let us know in the comments. Cheers Travis and everyone else!